The weather has been good - cool breezes with sunny skies. 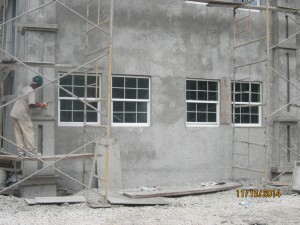 As you can see the windows arrived last weekend and were installed this week. We have completed the painting on the 1st floor and next week we will be working on installation of the entry doors and interior cabinet work. Work on the interior of the 2nd floor continues as well as exterior trim work and final coat plastering. Also, landscaping has started and some new road curb work and palm trees have been installed on the road way into the property. Read more about the condos in Belize at Grand Baymen's Building D by clicking here and check out the all of the exciting new construction photos we're posting in the Daily Progress Gallery.